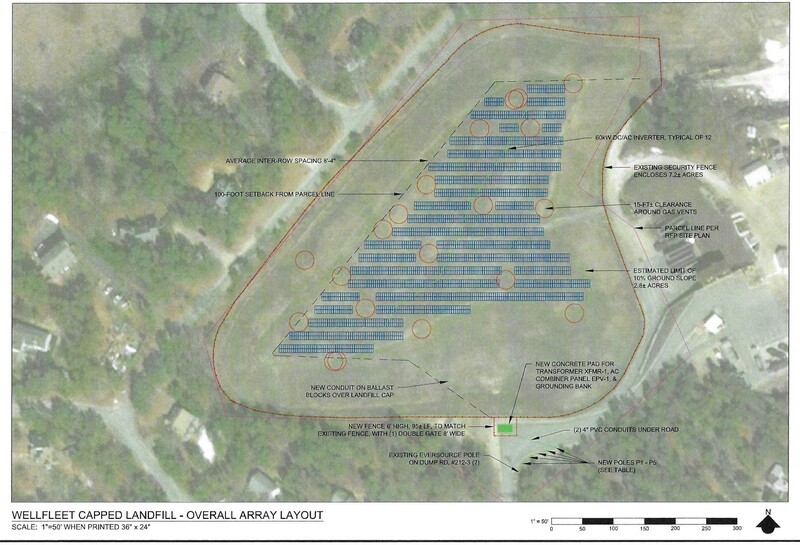 Wellfleet is planning a solar photovoltaic (PV) array on the capped landfill. After issuing a Request for Proposals (RFP) and receiving three proposals, the town has decided to enter into negotiations with Ameresco for an energy services contract to design, obtain permits, construct, operate, maintain and decommission a 1.2 Megawatt array of 2500 panels on top of the landfill. Ameresco has built, owned and operated at least twelve solar PV landfill projects for municipal customers in Massachusetts. The array will meet and exceed the town’s electric requirements. The town will also receive lease payments for the use of the site, payment in lieu of taxes, and electricity at a reduced rate for net savings to the town of about $60,000 per year for twenty years or $1.2 million over the life of the program. The array will conform to the zoning bylaw on the warrant for the upcoming town meeting (Article 42). It will meet or exceed the 100-foot setback requirement from the town property line. The array itself makes no noise and the electrical equipment will operate quietly and make less noise than two people in a normal conversation would make at a distance of ten feet. The array will face south towards the transfer station, so there will be no glare for abutting houses.